Working on Sarah's portrait order, and having flashbacks to beautiful, cool greenbelt waters, and her fabulous Boho ensembles - we can't wait till she sees these beautiful prints in person! We just love working with seniors like Pamela to showcase their talents, and the many sides of their personality! She is flying away to Scotland for college - TODAY (!) and we couldn't be more excited for her, and for her future! It's really September now! Senior year has officially started, and we just wanted to share one of Julia's beautiful images, with professional makeup by Stephanie Aesthetics. Get in touch soon (and tag your friends) to book one of our limited September sessions- they're going fast!! Here are a couple of our favorite moments from Anna's fabulous senior session. It was a tumultuous day, (we were shooting in the middle of a tropical storm!) - but you'd never know it from this girl's calm, effortless grace and beauty! We're so excited to be on Snapchat! Find us @ sparksstudio, and you can follow along with behind-the-scenes sneak peeks of our fantastic senior session experience! Running through the rain drops and dancing on the edge of yesterday's balmy, tropical storm -- meet Anna! The light, the girl, the session, all beautiful! Thanks so much! I can't wait to share the rest of this amazing session! Meet Melissa -- she’s a gentle soul. I’m not saying she doesn’t have a million other attributes that will guarantee her future success, like being smart, funny and clearly a razor sharp thinker. But her gentle nature is one of the things that strikes a person when you first meet her, it has nothing to do with the outer package (beautiful, I know), her warmth glows from within. So how do I approach a session that originates from the inside and rolls outward? Well, to be honest, it takes a little time and shines brightest with a healthy dose of trust. I worked with Melissa for over two hours. I can shoot a session more quickly if need be, but all things being equal, I believe authentic gestures come out over time. It’s these gestures and expressions that come forth as self consciousness falls away -- and it’s spontaneous, self expression that I look for with my lens. It’s never about being over posed and told to smile! 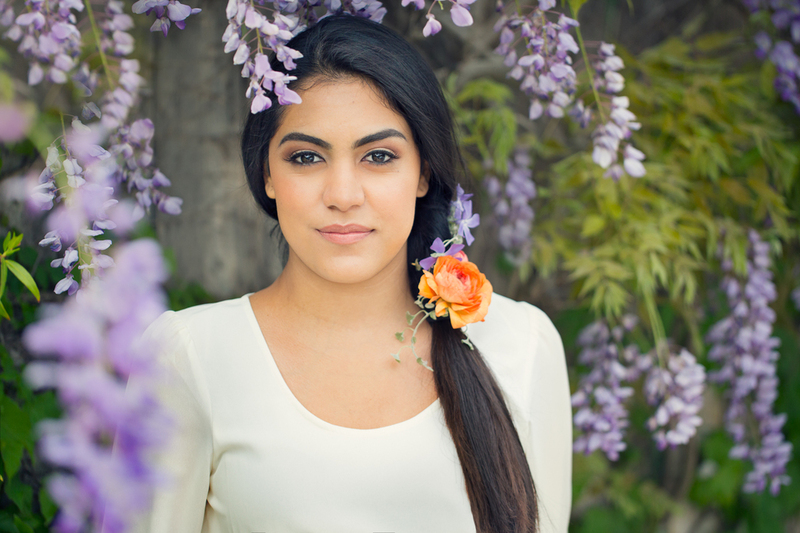 The first image with the wisteria was created at the very beginning of our session. Once you can see beyond her stunning beauty, you may find the intrigue of her quiet reserve. I see mystery, calm and strength. The middle two images show how I have begun to earn her trust and we are really having fun. Sessions are always pretty high energy and we laugh a lot. I guild, nudge and strive to create an environment where freedom reigns! The final image is one of the last of the session, the sun has almost set. We’d been on a little journey together and this last one shows how fun loving Melissa is, suggests her promise for the future, and momentarily captures her free spirit. Once the session is complete, I get to quietly mine the images we’ve created to portray the heart of a young soul. It’s wonderful work. If you’d like to see the rest of the portraits I presented to Melissa and her family, click here. Creating senior portraits is always such a collaboration, and this shoot was no exception! Here is a collage of a few images of Isabel from her session - she and I were able to relax and allow her shoot to unfold spontaneously and leisurely. She was comfortable enough to allow the many different aspects of her personality to be captured by the camera: her gentle nature, the grace that comes from years as a ballerina, her wonderful sense of humor (it was really cold that day, and we pretended it was a balmy 85 -- spring hadn’t yet arrived!) and her beautiful, creative boho self! Thanks Isabel! It was wonderful to come along for the ride. This is Laura my studio manager and expert flower crafter. She is setting up our new workshop that we're calling Blossom. It's a afternoon get together of girlfriends where we use the freshest of botanicals and create crowns, garlands and combs of tumbling flowers. I'll be sharing more photos of how we use these lush creations to make the the most amazing photographs! Some years ago a client introduced me to Breakthrough Austin. This organization provides a path to college, starting in middle school, for low-income students who will be first generation college graduates. We have been supporting their efforts ever since, as I believe there is nothing better than a good education to prosper in life. I am a first generation college graduate and was a real late bloomer when it came to getting my Masters of Fine Arts degree, which I received in 2012! But I understand the difference my education has made in my life. As the year draws to a close and Stevie is home from her first semester of college, I’m thinking about how fortunate we are that she has found such a good fit for her undergraduate studies. I know the final decision of which school to attend is a big deal for high school seniors and their parents. The focus is usually on where to go to college rather than if a student is going to qualify for college. I was honored this year when Breakthrough Austin asked me to photograph one of their up and coming success stories. He is currently in the Breakthrough program and his determination and charm are carrying him toward the goal of being the first to graduate from college in his family. It was a such a pleasure to meet him and create his photographs. If you are looking for a local organization to put you support behind for 2015, take a look a Breakthrough Austin, I bet you’ll like what you see! I mentioned in my previous post why I find photographs that convey motion visually interesting and compelling. Here I’d like to share a little on how I turned my desire for motion in my portraits into something fun, beautiful and a little nostalgic. I bought a bike. I looked for a while to find one that had some character and a vintage feel. I finally found one online that seemed to have good bones, and hubby and I set out for east Austin to take a look. I took it for a spin around the block and believed the seller when he said it was German antique. I later found out he was probably telling the truth because when both tires went flat the next day, the parts needed to fix it were almost impossible to find! Here is a pic of it in the studio after Steve took the whole thing apart to clean, adjust and repair -- all so I could have motion in my portraits during a shoot!! Have I mentioned what a great guy he is? Anyway, we did get it put back together and I am taking it with me sometimes on my early morning sessions. I’ve also included a few shots of two lovely clients who show how beautiful it can be to simply ride a bike. It’s a little bit rickety and you’d never win a race with it, but I find it offers a sweet sense of freedom, fun and flow to an image that I find magical. Plus, you can’t help but smile when you’re riding and I love to see that funny, little kid, wonder that bubbles up when people take it for a spin. Motion at it’s best. Let me know if you want that spontaneity in your session and we’ll bring the bike along, prepare to laugh out loud! When I look at a portrait I want to see the subject’s vitality, it’s that visual pop that makes the picture come alive. It doesn’t have to hit you over the head, but it has to be something special, otherwise, you won’t look twice. I chase that vitality with every click of my shutter. It can be found in a myriad of ways and is present in any photograph that captures your eye. Just look at a portrait that you love, it doesn’t matter if it’s someone you know or a stranger. If you enjoy looking at it, and could return to it time after time, it most definitely has a life force. There are so many ways this notion of vitality can be created in a photograph. But today, I’m interested in the feeling of motion and how it portrays life in a subject. Rocks don’t move, but people do! I’ve found that if a portrait can convey movement, however subtle, it can electrify an image with vitality. Without this elusive element, the subject may seems overly stiff and the portrait can feel too posed. Even in a beautiful, still and quiet portrait, movement in the body suggests impermanence, drawing you in, and conveying the passage of time. It isn’t necessarily easy to capture -- but when it’s there, it adds an ephemeral quality to a portrait and reminds us, life is just a series of moments we are all moving through. I know from talking to so many parents and high school seniors, this final year of high school is a time of both reflection and excitement about the future. I feel lucky everyday that I get to create beautiful portraits now, that will be cherished long after families have moved beyond this milestone year! There's still time to have your very own beautiful portraits made at Sparks Studio, and to have those amazing images in the yearbook that you'll keep forever! Your senior yearbook really is a time capsule, and we want to make sure you have the best memories possible to look back on! Contact us now and we'll plan a portrait session that'll be so much fun!! We just love it when people share creative things like this with the community. These watercolor backgrounds are just beautiful, so delicate and playful. We couldn't help but share them with you, too! You can download them for free, to be used as either phone or desktop wallpaper. Enjoy! Whenever a child leaves home to venture out into this wonderful and complicated world, it’s a big deal. It doesn’t matter if it’s our first child, the last, or one in between, they all have their special place in our hearts and in our family unit. I’m so fortunate that I get to create something that is left behind when their feet hit the road and their future is in their hands. Here are a few of the graduates from the class of 2014 and their siblings who I have photographed over previous years. These are clients who have canvas portraits on their walls of each child as they reach the milestone of their senior year. They make pretty beautiful collections. I’ve been shooting in Austin since 2001. I realize now how much I enjoy seeing the children I worked with years ago grow, change and experience the excitement that comes with leaving home. I don’t work with large family groups anymore, I love the artistic nature of having just one subject in front of my lens, photographing a high school senior fills that creative challenge perfectly. I’m always thrilled to be making portraits of the next graduating senior in a family. A closer look at these young people reveal amazing similarities and differences. While I’m photographing a sibling, the tilt of the head or the flash of a smile can take me right back to a different session with an older brother or sister. And yet, these kids come across as such individuals. When I listen to their dreams and aspirations, it’s so clear they are uniquely their own spirits -- and it is their time to fly! I love Wisteria more than Bluebonnets. Maybe it's the way the blossom tumbles down like a curl. The season is short lived, but that's okay, it's one of the things what makes them so special! ...that I love photographing. What I really love is the relationship of trust that develops during a session. It just has to be there to create good work and it has to be cultivated and won every time someone steps in front of my lens. This image is all about that trust. In recent years, I've turned my practice to working with mostly individuals, some pairs, and occasionally a group of three, because that's where I find my joy and that's what seems to tumble out all over my photographs. It's a gift the camera gives to me and I love to pass it on. That, and I still love babies! I know, I was really excited about the snow day in my last post, but today I just feel like a summer holiday. This portrait was made on a warm Austin day on our way to photographing at the creek. Delightful! Spring is almost here -- ahhhh.